* Para ver este blog en español, por favor hacer clic aquí. For each of the nine days of our Mayday! Mayday! 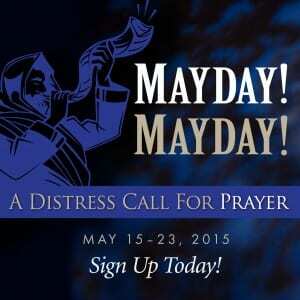 Distress Call for Prayer, I will provide a prayer that will help us stay focused so that we can pray with one accord. I will also share each day a video segment from the Joel 1 and Joel 2 messages that I gave at The Prophecy Seminar at The Cove in March of this year. Today, in preparation for Mayday! Mayday! I wanted to share a small portion of Joel Rosenberg’s concluding message at that same Prophecy seminar. The morning after he and I had taught through the book of Joel, he gave a stirring message from Ezekiel 33 that emphasized the weight of responsibility we bear to respond to the Truth as it matches up with the times in which we live.